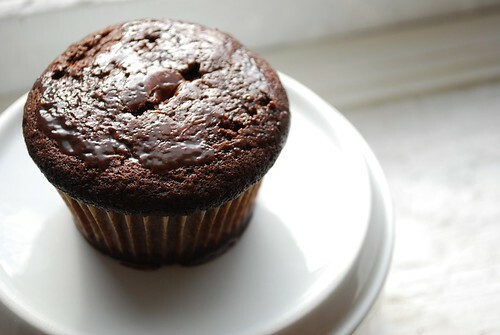 Recipe: Chocolate Muffins with Nutella Glaze | Dinner Love. There is a story behind these muffins. It was 7pm last Friday, on the night before Halloween. I had a party to attend but no idea what to dress as. The night before I had gone to a bar/club thing with some friends dressed as a Moulin Rouge/Can Can dancer, but that costume had involved wrestling myself into a corset (made by Dark Garden; these corsetieres are serious about their work) which is very difficult to do when you live alone. Lacing the back of your own corset while you’re wearing it is just a bit more involved than zipping up your own evening gown. Yes! It was a tray of baked goods. 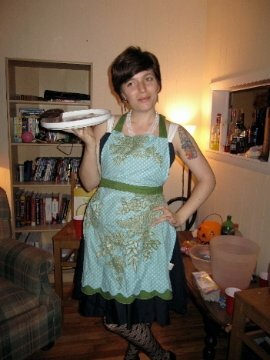 1950s housewives always have baked goods. I decided on muffins because I didn’t have ingredients for frosting, but I did have a recipe for chocolate muffins that claimed they were as good as cupcakes. Unfortunately, it was my first time baking with the oven in my apartment and the muffins ended up being burnt around the edges. I solved this problem by creating the Nutella glaze – I essentially mixed together Nutella and milk and poured it over the muffins. Yum! Oh, and in case you’re wondering what happened to my Recipes I Made as a Child segment, I haven’t forgotten! I plan to start back up next week with a recipe from Samantha’s Cook Book for Apple Brown Betty. I can’t make too many baked goods in a single weekend. That’s just insane. This isn't too far off from what I look like everyday, actually. Notice the single muffin. They were a hit! 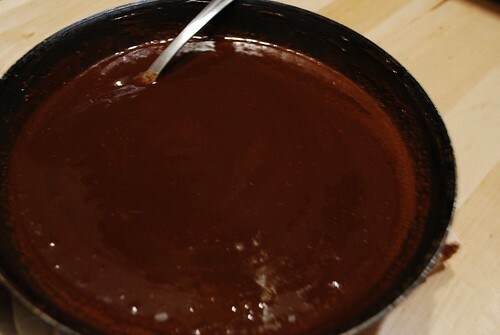 Melt together the butter and the chocolate in a pan on low heat, whisking occasionally so that it doesn’t burn. Allow to cool. 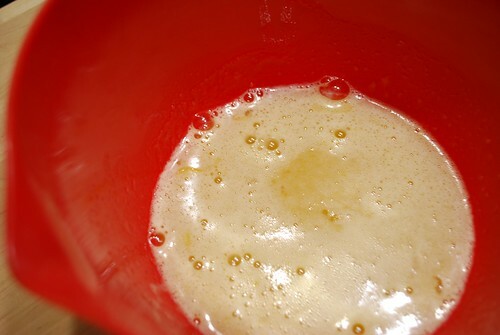 In a separate bowl, whisk together the eggs and the sugar until they are foamy. Once the chocolate and butter have cooled (a little warmer than room temperature is ok, you just don’t want it to be hot or there is a chance it will curdle the eggs) add it to the sugar and eggs, stirring to combine. Add the sour cream. Then, mix in the flour, baking soda and baking powder. Spoon the mixture into muffin tins, filling them nearly to the top. 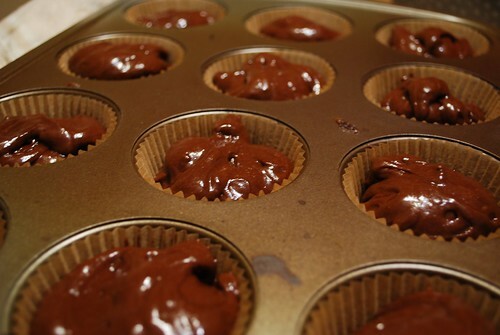 You should have plenty of batter to make 12 muffins. Make sure you either grease the muffin tins or use liners! Put in a 375˚ oven for 20-25 minutes, or until a toothpick comes out clean. When they are done and while they cool, make the glaze. Take 2 TB of Nutella and put it in a pan on low heat. Slowly mix in the milk a little at a time. 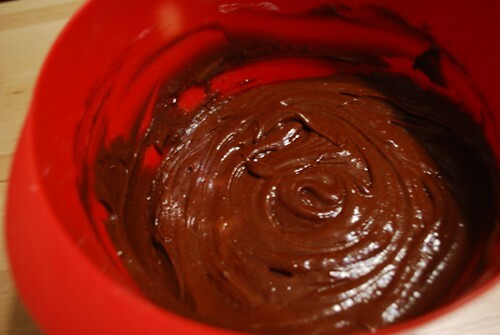 You want the consistency to be even and smooth, like liquid Nutella. Take a fork and pierce the surface of each cupcake about 2-3 times. Pour (approximately) 1.5 TB of Nutella glaze over each muffin. If you have more glaze, just distribute as evenly as possible over the muffins. Allow the muffins to cool. Give to your friends. Even though there have been 3 years since you posted this recipe, I just found it and it looks delicious! I want to try it, the thing is I don’t know how much butter is ‘one stick’…Could you tell me in grams or oz? In the US butter is usually sold in 1 pound increments, divided into 4 sticks. Each stick is about 4 oz (8 TB, 1/4 LB). Hope that helps!